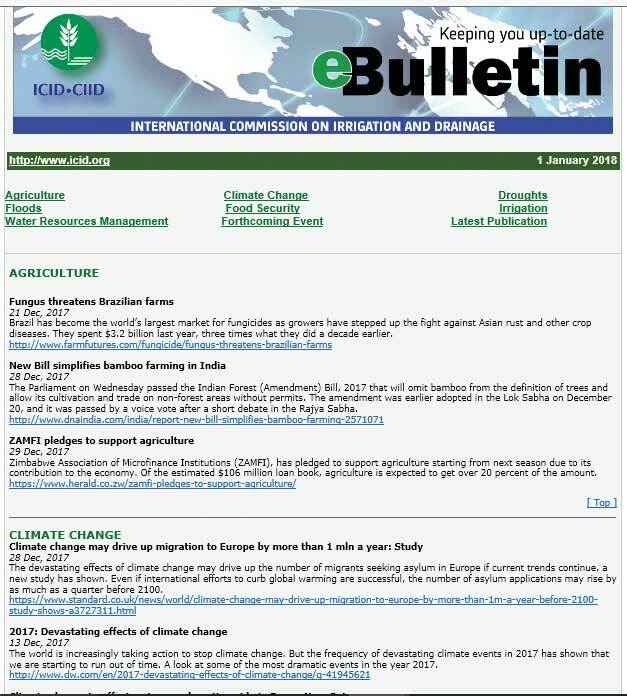 ICID e-Bulletin is a weekly compilation of important news items on agriculture, climate change, drainage, droughts, floods, food security, and irrigation as well as forthcoming events, latest publications, editorials and opinions and employment opportunities that might be of interest to the ICID fraternity. It is a full time coverage of latest irrigation and drainage issues followed by the hyperlink that directs the reader to the detailed body of the matter. The information contained in the compilation is taken as is from sources external to the ICID Central Office and freely available on the Internet.